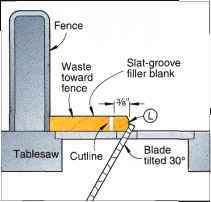 stopblock to your tablesaw's miter gauge extension, as shown on Drawing 4, opposite page, to ensure that all tenons are identical. Make test cuts first in scrap stock, test-iitting the tenon for a snug fit into the grooves and mortises in the legs. full length of the bottom edge of both middle side rails (D) and in the top edge of the lower side rails (E), where dimensioned on Drawings 5a and 5b, above. 5 Cut a '/"-wide groove 'A" deep and 3/s" from the top, along the inner face of the upper side rails (C) for the tabletop fasteners. 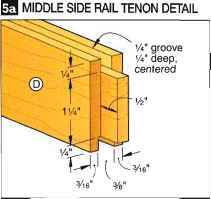 Note: Double-check the location of this groove against the actual dimensions of your tabletop fasteners.